My only gardening experience prior to my current garden was many, many years ago (20 to be exact) when I lived in a rented cottage in Green Point. The cottage had a tiny garden, total size about 8 square metres of which most was lawn. In the beds around the lawn I half-heartedly dabbled with planting a few things – mostly annuals and one year I bought a batch of bulbs and by some fluke ended up with a lovely little garden full of spring flowers – I recall daffodils, ranunculus and freesias – and for weeks on end I had huge bunches of cut flowers in the cottage, thanks to that one time planting. I remember it being very easy (all I did was plant and water, I don’t think I ever fed them). I am hoping to do something similar in my own garden this year, so I’ve already purchased Alliums, Freesias, Anemones, Ranunculus and Dutch Iris which will be going into the ground next month. I still want to get some Daffodils and Tulip bulbs which I haven’t found yet at the nurseries. At the Rare Plant Fair held at Rustenberg which I attended yesterday I met a Horticulturist called Jim Holmes (http://www.capeseedandbulb.com/). He had an interesting selection of rare bulbs for sale. Initially I walked on thinking I had quite enough bulbs already but after tea we wondered back over to Jim’s stand and the photographs of the blooms these bulbs will morph into had me taking a second look. Needless to say I walked away with a bunch of bulbs I had no clue about other than that they may give me some pretty interesting flowers if I plant and treat them right. A few months ago I bought a book called “Grow Bulbs” by Graham Duncan, a specialist horticulturist at Kirstenbosch Botanical Garden where he curates the collection of indigenous South African bulbs. How useful that book is now! I’ve spent a few hours doing my “homework” and realise now that these bulbs are going to require some commitment and extra care. Many are rare or classified as vulnerable so I feel some sort of responsibility in making them grow and hopefully getting them to thrive. So here are notes and photos I have found on my purchases and for those that are interested I have added notes about how I have to plant them and care for them to get them to flower. 1). ALL the bulbs I purchased require full sun. (yikes!). That will be the biggest challenge and may require daily moving around of the bulbs. To do that I will have to plant them in pots as I have very limited full sun areas. 2). I have a mole / vole / some underground-digger-animal problem here from time to time. So planting the bulbs in pots is definitely the way to go. This is an endangered plant know as Cup of Wine. These require constant moisture throughout the growing period and at flowering time. According to the book they do best in containers that are placed in saucers filled with water in winter and spring. I have eight. 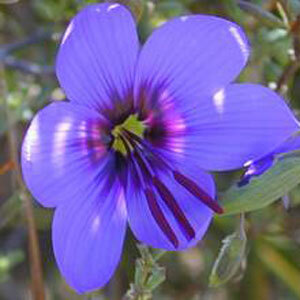 Also an endangered plant, this is called the “Blue pride-of-Niewoudtville. They grow 10 – 20 cm in height. An early flowering species with intensely blue flowers. As for radians, they will require deep drenching throughout the growing and flowering period. I have four of these. The flower spikes hold large orange and green coloured flowers. 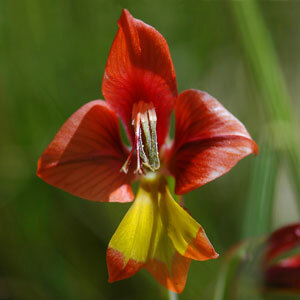 Very similar to Gladiolus equitans but more slender foliage. The flowers are fragrant. 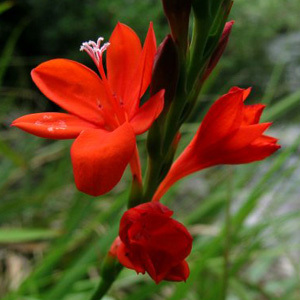 Grows in sandy soil so best grown in a pot with some extra sand added to the soil. Should be allowed to go dry in summer during dormant period. I have three bulbs. Isn’t this one exquisite? 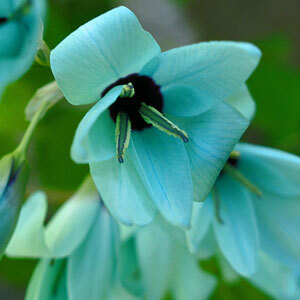 Known as Green ixia or groenkalossie (in Afrikaans), it is an exquisite species with many-flowered spikes of sea-green blooms with black centres. According to the book it will do well in deep terracotta pots but will be short lived in a plastic pot! I have four of these bulbs. This plant is classified as vulnerable. 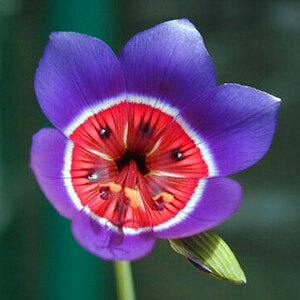 Its a large flowered species that is apparently easily cultivated in deep pots or raised beds and rock gardens. These plants also require regular deep drenching throughout the growing period. I have six of these. Flowering time is April to October so I better plant these right now! Apparently it is an large-flowered species that is “an ideal subject for naturalising in lawns as it can withstand summer irrigation” (according to the book). I have four of them. 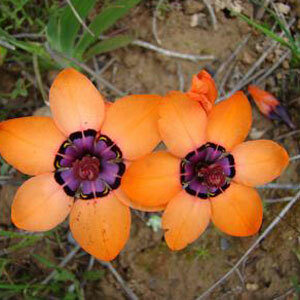 Sparaxis elegans is classified as vulnerable. 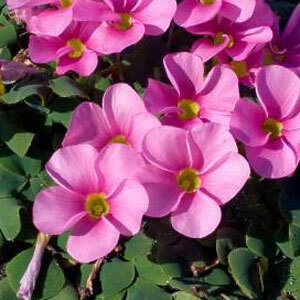 Its a very pretty salmon-pink flowered species that is ideal for growing in pots. The corms are highly sensitive to summer moisture so not for planting in amongst my plants. I only have two of these. These I recognise – I think they are not that unusual, I see them growing on the Cape West Coast. Flowering is from April to July so I better plant them pronto. The corms multiply quickly and need to be lifted and divided to encourage flowering. I have four of them. My last purchase was Narcissus cantabricus. 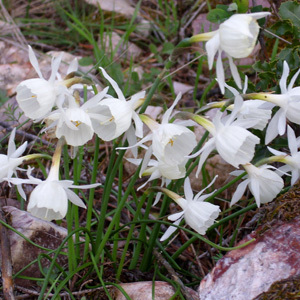 The Narcissus is not an indigenous plant, but very beautiful in my opinion. It appears to do well in semi-shade to full sun so this one will be easier for me to grow. As I only have four bulbs I’ll still keep them in pots. Its deciduous, low maintenance and perennial so might be best planted along with my other standard bulbs. 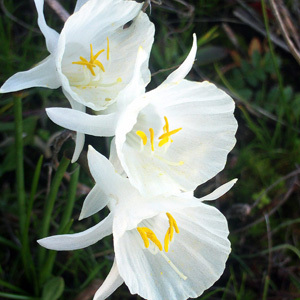 Note: “Narcissus is a genus in the Amaryllidaceae family native to Europe, North Africa and Asia. 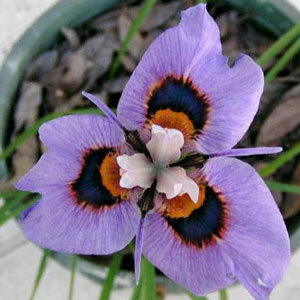 As a popular garden plant it has been hybridized heavily, and there are new ones being introduced every year“. What I don’t really understand or get is whether I should put each of the indigenous bulbs in an individual pot or whether planting all of them in one large container will work. Visually I would imagine one (or two) containers filled with different blooms may look better but I don’t know what is best for the plants. Does anyone have any opinions or suggestions? Good luck in your shady garden…! Oh wow, Chris! These are all so beautiful and all of them seem so delicate!! You are very brave to tackle something so ‘difficult’! I can only wish you luck on this project!! I have no experience, but I am sure you will get some help from our friends out there! Very interesting! Good luck with these. Mine started in separate pots. But they seed themselves, and hybridise. Then the cats break the labels. And you’ll look back at this post, and either think – So THAT’s what that is! Or sadly, I used to have some of those, somewhere … The purple oxalis would be the one you see in the lawns at Kirstenbosch? Hi Diana – Thank you – so then I think I’ll get separate pots for them all – or maybe a slightly larger pot and plant a few of the same bulb in a larger pot. I’ll have to see what pots I get this week. Oh wow those all look quite exotic but I do recognise a few (watsonia, sparaxis and oxalis). I wish you the best of luck with these. I hope you will show us photos once they get going. So many beautiful plants, and unusual too! Thanks for showing these, I really enjoyed looking at them. That green ixia really caught my eye. I hope you find enough sun for your bulbs – I am looking forward to more pictures. Hi Masha – the green / turquoise ixia is my favourite too! Will definitely post photos when they flower!